Rick Camp, a veteran front of house engineer, visited the Buffalo Bill's Star of the Desert Arena in Las Vegas on January 16 for a one-on-one demonstration of H.A.S. Productions’ VUE Audiotechnik system. 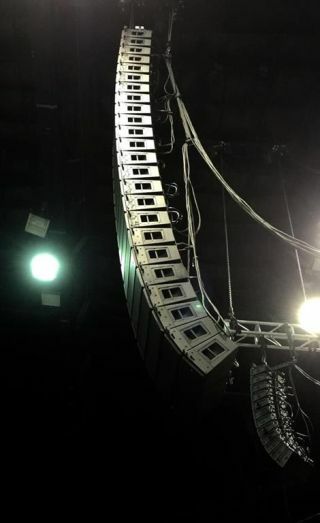 24 al-8 speakers lined each side of the main stage in the Star of the Desert Arena. The VUE rig was hung for Patti Labelle's performance. Prior to punters descending on the arena, Camp took the time to test drive the system with his own protocols rig with J-Lo's 2012 World Tour live track recordings and a H.A.S. provided Avid Profile console. The system featured a full arena stereo hang with 24 al-8s per side as the mains, and 8 al-4s per side as the side fills. 14 hs-28 subwoofers were lined on the ground along the edge of the stage for low-end extension. With so many boxes in the air, Camp proceed to cut some low frequency energy in the hanging system, -8dB at 80kH to perfect a balance of lows, mids, and highs. The high frequency energy in the VUE al-class systems produces a clear vocal tone due to the company's use of beryllium diaphragms in their high-frequency drivers. The complementary mids and lows are delivered using Neo-Kevlar transducers. The system is powered by VUE's proprietary V6 Systems engines which have onboard DSP and networking, allowing full control of the flown system on the ground. These engines allow full smooth transition between the al-8 mains system to the al-4 side fills, without any coloration.